Caffè Nero (Italian for black coffee) or Caffè Nero Group Ltd is a European style coffee house brand with its headquarters in London. It was founded in 1997 by Gerry Ford. Currently, the company runs more than 700 coffee houses worldwide and is established in seven countries: the UK, Ireland, Poland, Cyprus, Turkey, the UAE and the United States. 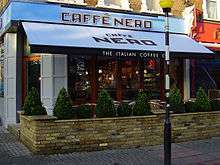 Caffè Nero was founded in 1997 and in March 2001 joined the London Stock Exchange under the symbol CFN. After a highly successful period on the London Stock Exchange, in early 2007, Caffè Nero was taken private in order to give it more flexibility to grow the business. From 2007 onwards, the company has been expanding internationally: in Turkey in 2007, in the UAE in 2009, in Poland in 2012, in Cyprus in 2013, and in Ireland and the United States in 2014. Along with traditional espresso-based drinks, such as espresso, cappuccino, latte and macchiato, Caffè Nero also sells Frappé Latte (an iced latte), Fruit Boosters (an iced fruit drink), and Hot Chocolate Milano, an extra sweet and thick hot chocolate drink. Several specialty coffee based drinks were launched in 2007. These were Caramelatte (a vanilla-flavoured latte served with whipped cream and caramel sauce topping), and the White Chocolate Mocha (a twist on the classic caffè mocha). Caffè Nero also has its own line of panini, pasta salads, and soup dishes. The company buys coffee from traders who have direct relationships with farmers and pay a "fair" price. It works continuously to establish relationships with farmers to offer them what they actually need in their community. The company imports its coffee beans directly from exporters in the coffee producing countries. It establishes strong and direct relationship with the supplying farmers and pays a 'fair' and rewarding price to them. It also works to promote the development of the coffee communities. The company has a reward scheme for customers. Each time a coffee is purchased, the customer's loyalty card is stamped with the 'Nero Coffee Bean Logo'. Once a card has nine stamps, the bearer is entitled to a free drink of any price (including iced drinks). Caffè Nero operates a "one to one" service where a barista takes a customer's order, makes their coffee and then serves them their drinks. Starting in London in 1997, the first branch was Old Brompton Rd, South Kensington. In 2005 Caffè Nero was named the 20th fastest growing company in by Business Week Magazine. Caffè Nero continued to experience rapid growth and by January 2015 it had registered 69 consecutive quarters of positive like for like sales and EBITDA growth. In 2013 and 2014, it was named in the Top Track 250 by The Sunday Times. The company believes its success is primarily due to its record of providing the best tasting coffee on the high street. All of its beans are imported into the UK and then roasted at the company's dedicated plant in Battersea, South London. Much of the food sold at Caffè Nero has been developed in conjunction with Italian chef Ursula Ferrigno who the company says help it to serve "high quality, interesting, artisan food" including "traditional soups, salads, fresh pastries and delicious cakes". The company's founders recently started the Nero Foundation to support coffee growing communities and local communities located near to where it has stores. Funds from the Foundation will be invested to enhance community amenities, such as schools in rural areas where the company sources its coffee beans. Caffè Nero also encourages its staff to support local causes that are close to their heart. The company has a commitment to provide funds up to the equivalent amount raised by employees for local good causes. Caffè Nero is also a supporter of UK Coffee Week. Project Waterfall is the central focus for fundraising during UK Coffee Week, and aims to transform lives by improving access to safe water, hygiene and sanitation in African coffee-growing countries. 100% of all funds raised from consumer donations will directly benefit this cause. Caffè Nero customers can choose to add 5p to the price of a coffee – a sum matched by the Nero Foundation. Caffè Nero has fostered a relationship with the Arts for over a decade. The company has supported a number of exhibits and works with the likes of Tate Britain, Tate Modern, the Royal Shakespeare Company, National Portrait Galleries, Ashmolean Museum, The British Museum, Italian Cinema London and smaller organisations on a more local level. Caffè Nero also supports unsigned and young musicians. Its Artist of the Month programme sees talented young musicians reach a new audience through free gigs in the company's cafes. Their music is played in stores every afternoon for a month and CDs are available for purchase from time to time. The company is also a sponsor of the Cornbury Festival in Oxfordshire. A number of the company's shops have either had planning permission controversies and/or enforcement action taken. Caffè Nero have been accused of "bully-boy tactics"  following the opening of several stores in the United Kingdom, without the legally required planning permission. However, all 11 stores where there have been planning permission issues have subsequently been granted planning permission. In May 2015, the company said that they will stop serving milk from farms in Gloucestershire's badger cull areas following intimidation from animal-rights activists. On 29 May 2015, the company said: "Caffè Nero has instructed its partners supplying to stores which are situated around the cull zone areas to supply milk from farms outside of the zone. On 7 July 2015, rats were videoed scurrying along the floor and counter in their Donegall Square West unit in Belfast, despite having previously been awarded a four out of possible five star rating by inspectors from Belfast City Council. Having being notified of the incident, the store was closed for a full investigation and has subsequently reopened; the source of the infestation was an adjacent disused building. Caffè Nero have a loyalty card programme in which customers may be given a piece of blue card with 9 white circles (designed to look like empty ceramic cups viewed from above). Whenever they buy a drink, they can ask for a stamp in one of the white circles. A card with all the circles stamped can be used to pay for any Caffè Nero drink. ↑ "Which coffee shop chain serves the tastiest coffee?". Which.co.uk. 11 July 2013. Retrieved 9 May 2014. 1 2 "Caffè Nero". Caffenero.com. Retrieved 9 May 2014. ↑ "Caffè Nero's got a whole latte love". Real Business. 27 November 2007. Retrieved 9 May 2014. ↑ "BusinessWeek Online: BW Magazine". Businessweek.com. 24 October 2005. Retrieved 9 May 2014. ↑ "Caffè Nero". Caffenero.com. Retrieved 9 May 2014. ↑ Hilton, Rhiannon (22 August 2013). "Caffè Nero organise pirate-themed treasure hunt for St Luke's Cheshire Hospice appeal". Crewe Chronicle. Retrieved 9 May 2014. ↑ Archived 28 July 2013 at the Wayback Machine. ↑ "Caffè Nero". Caffè Nero. Retrieved 9 May 2014. ↑ "Caffè Nero at Cornbury". YouTube. 19 June 2012. Retrieved 9 May 2014. ↑ "Planners say 'no' to Caffè Nero in Skipton (From Craven Herald)". Cravenherald.co.uk. 15 December 2011. Retrieved 9 May 2014. ↑ "Caffè Nero bans 'badger cull' milk after animal rights threats". Gloucester Citizen. 1 June 2015. ↑ "Caffè Nero Council visit after rats filmed". BBC News. 5 August 2015. ↑ "Yoyo Wallet selected as mobile payment and loyalty strategy partner for Caffè Nero". Businessmole. 3 November 2016. Retrieved 7 November 2016.